In Hauran, the Northern desert region of Jordan a few kilometers from the Syrian border there are the ruins of a great black basalt city dating from the 1st Centurary A.D. : Umm al Jimal (Arabic: ام الجمال, “Mother of Camels”) also known as Umm el Jimal or Umm idj Djimal. To the East Of Amman lays the great Eastern Desert which along with Jordans other desert areas make up 80% of the country yet support only 5% of its population, a fact it is easy to forget from the homely confines of the Canary Hotel in Amman. My story of the Death Of An Endangered Arabian Oryx From Eating Plastic Bags in Wadi Rum, Jordan. After the man made wonders of Petra we headed a little further south to the spectacular natural splendor that is Wadi Rum. In my travels there are certain hotels, not the opulent and comfortable but ultimately faceless ones, but the cheaper more full of character ones, that have left an indelible impression on my memory, stories can be told (some not in polite company) about them and occasionally years later I wake up from a particularly vivid dream upset to find that I’m not in the hotel room I was dreaming of. The “Navrang” in Delhi, The “Hotel California” in Khatmandu, “Thai Thai” guesthouse in Bangkok, The “Regale Internet Inn” in Lahore and The “Z hotel” in Puri to name just a few. The scenes of some of the greatest experiences and the best friendships of my life have begun in these places and many of them will remain with me till I make it to a rocking chair on a porch somewhere to reminisce. Well now I have a new one to add to my list of places of which I sometimes dream. 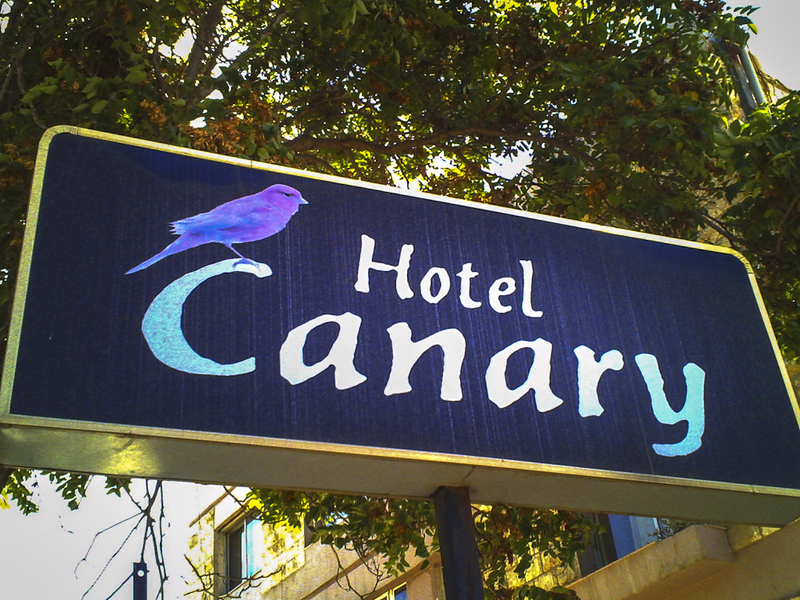 I’m speaking of “The Canary Hotel” in Al Weibdeh, Amman, Jordan. “Hey!, I’m in a Muslim country, why don’t I go down to the U.S. Embassy?”……..